Celebrate Connecticut’s first open green spaces! Join the Norwalk Historical Society on Earth Day Sunday, April 22, 2018 at 2:00pm at Mill Hill Historic Park for a look at the history of the town greens of Connecticut. Author Eric D. Lehman will lead a lively lecture: “Time Machines to the Past: Connecticut Town Greens”. Town Greens are thought of as relics of another time, but as residents of Connecticut, they are part of our lives. In fact, over 170 public spaces remain on which we can walk where our ancestors and predecessors walked. Author Eric D. Lehman will tell the remarkable story of these time machines that put us in touch with thousands of people over hundreds of years, from the past to the future. 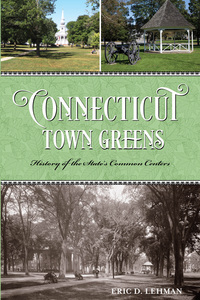 Mr. Lehman will also be selling and signing copies of his book, “Connecticut Town Greens”. If weather permits, a stroll to Norwalk’s Historic Green for refreshments will conclude the event. Tickets are $5.00 are can be purchased at www.norwalkhistoricalsociety.org or by calling 203-846-0525. Mill Hill Historic Park is located at 2 East Wall Street, Norwalk, CT 06851. Limited parking on site. Additional parking follow signs to overflow parking across the street.